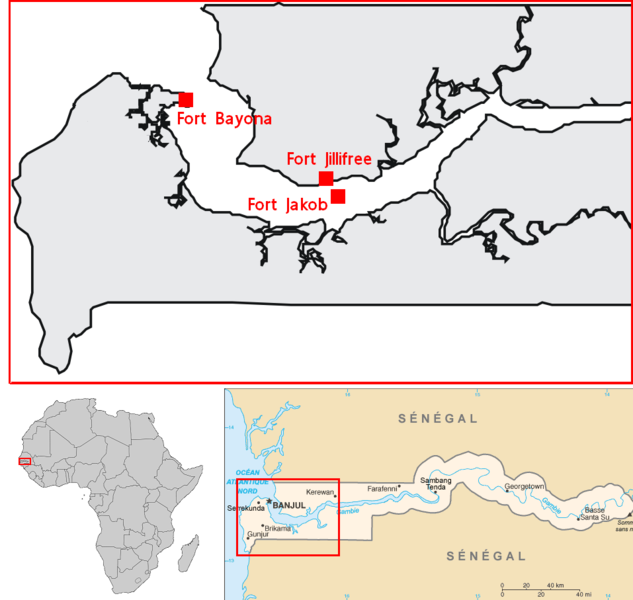 Under the rule of Duke Jakob Kettler (*1610, †1682) the Duchy established its first colony in Africa in 1651 at St. Andrews Island at the Gambia River and founded Jacob Fort there. The main export goods included ivory, gold, furs and spices. Soon afterwards, in 1652, Courlanders established another colony, in Tobago in the West Indies. There the main export goods included sugar, tobacco, coffee and spices. However, during this time, the Duchy of Courland remained an object of interest for both Sweden and the Polish-Lithuanian Commonwealth. In 1655 the Swedish army entered the territory of the Duchy and the Swedish–Polish war (1655–60) had begun. The Swedish army captured Duke Jacob (1658–60). During this period, the Dutch took over both of Courland’s colonies, and the merchant fleet and factories suffered destruction. This war ended with the peace Treaty of Oliwa (1660). Courland regained Tobago on the basis of the treaty and held it until 1689. Duke Jacob set about restoring the fleet and factories, but the Duchy of Courland never again reached its pre-war level of prosperity. Although nominally a vassal state, the dukes operated autonomously*wI. Courland was a prosperous and cultured German-speaking Duchy proud of its traditions and history*j. Strongest religions were Lutheranism and Roman Catholicism. Strong jewish comunity lived there (50-60% of the Jews living in Riga in the early 20th century had family roots in Courland*j.
Courland had a population of an estimated 200,000*t. It encompassed the areas of Courland and Semigallia, but several parts were joined later, f.e. Bishopric of Pilten was sold by Denmark in 1585. The capital was Mitau (Jelgava), important harbours on the coast of Baltic sea were Windau (Ventspils) and Libau (Liepāja) and bishopry was in Pilten (Piltene). Wilhelm Kettler (second duke of Courland from 1587 to 1617) developed metalworking and shipyards in Piltene region. The new ships delivered the goods of Courland to other countries*wII. This was very important for the incoming development of seamanship during the reign of Jacob Kettler (1642–1682, son of Wilhelm). During his travels in Western Europe, Jacob Kettler became the eager proponent of mercantilist ideas. Metalworking and ship building became much more developed, and powder mills began producing gunpowder. Trading relations developed not only with nearby countries, but also with Britain, France, the Netherlands and Portugal. Jacob established the merchant fleet of the Duchy of Courland, with its main harbours in Windau and Libau*wII. These cities were the main harbours for all Polish-Lithuanian commonwealth. Yet, at least for a short period of time, Courland had owned one of the world’s largest merchant marines. Between 1660 and 1681 the Jakobskanal (Jacob’s Canal) connecting Mitau with the Dvina, was dug*h. Since 1638th until the end of the reign of James in 1682, 44 warships and 79 merchant ships were built in Windau shipyard. In 1651 Duke Jakob decided to purchase the first property in West Africa and ordered Major Heinrich Fokam to lead this expedition. 3.9.1651, the ship “Walfisch” (The Whale) with 20 canoons left Windau. After a few months, followed by the sailing vessel “Crocodile” (crocodile). They established trading settlements there, with the main stone fortress at St.Andrew isle. Though the English Crown had previously granted the island to two separate companies in 1588 and 1618. The fort named Fort Jacob after Jacob Kettler, the Duke of Courland, was used it as a trade base until 1659. Slavery in Poland was forbidden in the 15th century and formally abolished in 1588 in Lithuania. Still, Courlandians actively participated in the slave trade. Slaves just were not captured near the colony. Roughly 900 slaves were taken annually to Tobago from 1654 to 1658 (cca 4500 totally). The Courlanders brought salt, iron, brandy, glass and amber from Europe to trade for ivory, gold, hides, pepper, wax, indigo, coffee, ebony, spice, dyeing material and pearls. It was exported to Sweden, Poland and Russia. 18-20 expeditions involving 28-31 ships left Courland for Africa, althougt three expeditions did not make it to Gambia. Dutch protected Courlandians but they also occupied Jacob Fort and soon expelled Courlandians out in 1659. Than French pirate Du Quesne licensed by Sweds destroyed the colony. Gambian tribesmen drove the Dutch out off the fort by cutting off the water supply. Dutch left the island after wrecking anything left standing. The Duke regained the colony for a short while. On March 6, 1661, a British expedition under Robert Homes landed there and demanded the fort, which the Courlanders just two days earlier had completed repairing the damage done during the Dutch occupation. Five British ships against four men and two women that remained alive was not a match, thus they left. Because of the the forecoming English bloody slavery trades centralised at St.Andrew, local tribes had to remember Courlandians in a better way. The land leased from a tribe served for a settlement by Courlandians, would later become capital of Gambia. Carribean tribes never stayed for long on Tobago. They lived on other islands, but not there. Tobago was discovered by Cristoforo Colombo in 1498. The first colonizing attempt was made by Juan Rodriguez (ESP) in 1614 and lasted four months. Dutch colonization begun here at 1628 with 68 colonists. After more ships arriving in 1629 and 1632, about 200 colonists lived here. Spanish expedition destroyed the settlement and massacred the colonists on 1 January 1637. A few months later, in 1637, a Curonian ship with 212 colonists attempted to found a colony on the island but both this attempt and a subsequent one, in 1639, ended in failure. Than the English colonists attempted to found a settlement on Tobago in 1639 but they were forced to withdraw in 1640. A renewed English attempt in 1642 met the same fate. Two ships under Captain Caroon with about 300 Courlanders made a another attempt to colonize Tobago in 1642. Jesuit missionaries among the Carib quickly agitated and armed the tribes into attacking the settlement. They killed many Curonian colonizators and survivors evacuated to the Wild Coast (today’s Guyana, *t) or to Tortuga and later Jamaica (*wIII). In 1647, a third English attempt to colonize Tobago also failed. On May 20 1654, the ship “Das Wappen der Herzogin von Kurland” (The Arms of the Duchess of Courland) arrived carrying 45 cannons, 25 officers, 124 Courlander soldiers and 80 families of colonists to occupy Tobago. The settlers were of diverse ancestry – Germany, Scandinavia, England, France, others and mainly Dutch – they just had to recognize Duke’s authority. 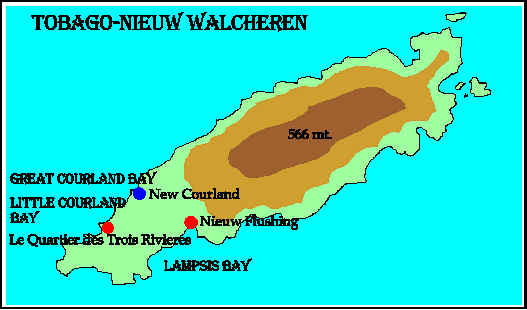 Captain Willem Mollens declared the island “New Courland” (Neu-Kurland). A fort was erected on the south-west of the island, also called Fort Jacob (Fort James) with the surrounding town called Jacobsstadt (Jamestown). Other features were given Courland names such as Great Courland Bay, Jacobs (James) Bay, Courland Estate, Neu-Mitau (New Jelgava), Libau Bay and Little Courland Bay. An Evangelical Lutheran church was built by the Courlanders in their first year on the island. In September 1654, a Zeelandian expedition under Pieter Becquart founded a settlement at Lampsins Bay on the opposite side of the island. This new settlement was named Nieuw Flushing. The Dutch built three forts here. The strongest was called Fort Lampsinsberg, the other two were Fort Beveren and Fort Bellavista. Thus the island was divided between the two nations. Despite the close relationship between Courlandia and England, English pirates raided the island in 1655. Duke managed to take control of the island. Shortly-lasting Tobago colony brought much wealth to 700 Courland colonists. African slaves were working hard at 120 plantations. Several sugar rafineries, two rum destilleries and an indigo factory were established exporting goods to Poland, Sweden and Russia. Courlanders are gone from their-former colonies. The Courland Bay on the west coast of Tobago remains as a reminiscence of their presence. 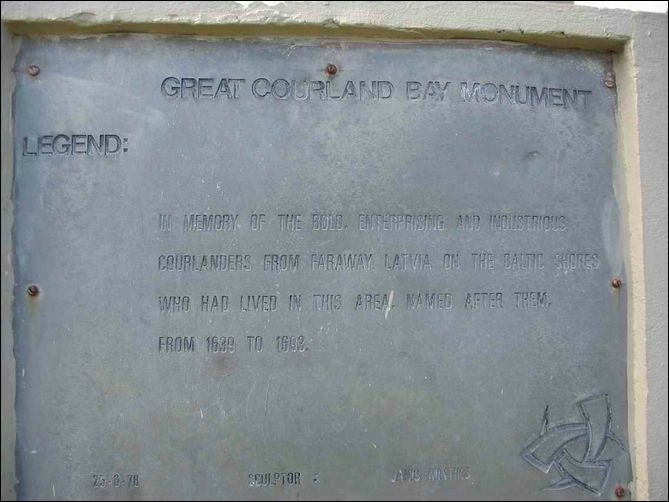 The Courland Monument near Courland Bay commemorates the Duchy’s settlements (at4). *wIII Maybe some legends about the well-treating Curonians still survives around the mouth of Gambia river or in literature. Eventhough this epoque is linked mainly with bloody slavery market, it can be also seen as an era of heroic attempts for both Latvians, Lithuanians and Poles (eventhought leaders were speaking German and 80% of colonizators were not from Courlandia). It is important to have some heroes. Mainly Greger (“g”; at5) and wikipedia. Attached images are downloaded from wikipedia.